Oarfish are elongated forms of pelagic lampriform fish. 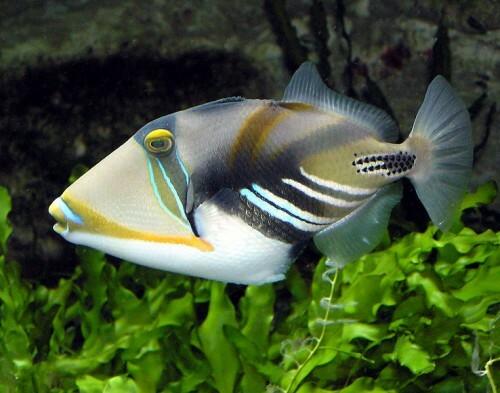 It is rarely seen, but it is found in temperate to tropical oceans. There are 4 species in the oarfish family in 2 genera. One of these dubbed the king of herrings (Regalecus glesne) is in the Guiness Book of World Records for being the longest bony fish alive at up to 56 ft (17 m) in length! They have highly compressed and elongated bodies so they were previously believed that these fish rowed themselves through the water with their fins. As they were beached after storms and as they lingered at the surface when they were sick or dying, they are most likely the source of sea serpent tales from the old days. They have a ribbony silver body and have pink to red dorsal fins. 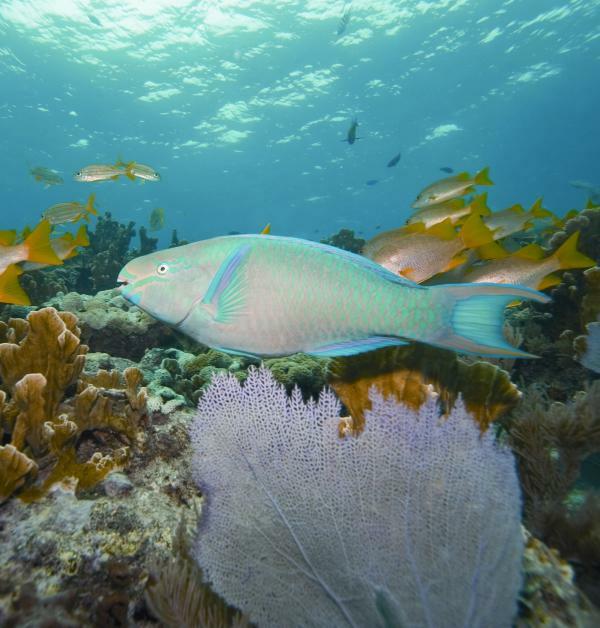 They have 400 dorsal fin rays, and the first 10 or 12 of these are elongated at varying degrees to form a crest. None of the fins have spines, and one NZ researcher has claimed that the oarfish gave an electric shock when touched. It has no visible teeth, but it does have a protruding mouth. The body does not have scales unlike regular fish. The colour of the oarfish’s flanks do vary as they can have blue streaks, black streaks, black dogs, and even squizzles. However, these marks fade after death. As mentioned above, it is rare to see the oarfish. 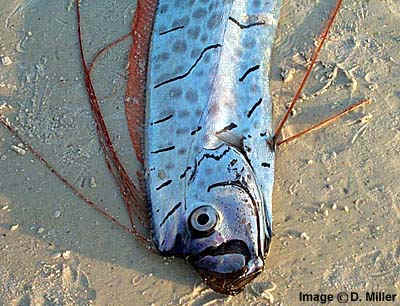 However, some people have been able to catch them without having to wait for the oarfish to be washed ashore. The larger oarfish are considered gaming fish, and are fished commercially. However, their flesh is actually not popular or well regarded as its flesh has a gelatinous consistency. Some divers have also been lucky enough to see them too. What we do know that they appear to be solitary animals and can go down to a depth of a least 3,300 ft (1,000m). They have been found all around the world, from England to Thailand. The US Navy's Big Catch! Their primary food source is zooplankton. They also selectively eat tiny euphausiids, shrimp, and other crustaceans. Squid, jellyfish, and small fish are also eaten. 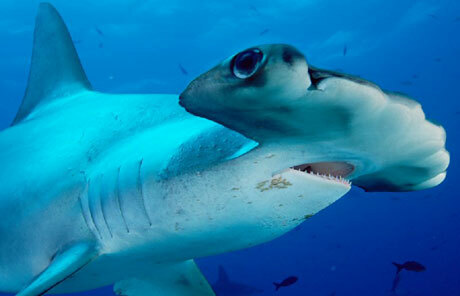 Its predators include large open-ocean carnivores such as the Oceanic Whitetip Shark. The oceanodromous (Regalecus glesne) has been recorded as spawning near Mexico during the months of July to December. They release brightly coloured and bouyant eggs, that are about 6mm wide. After 3 weeks, the eggs hatch into active larvae that feed on zooplankton. Larvae and juvenile oarfish have been observed drifting near the surface which is different to the adult oarfish who only come to the surface when they are injured or sick.